The Lamar Canyon pack in 2012. Photo by Doug McLaughlin, used with permission. When Congress listed the gray wolf (Canis lupus) as endangered under the new Endangered Species Act in 1974, it set the stage for a famous ecological experiment. Working within the Northern Rocky Mountain Recovery Area (NRM), which included Idaho, Montana, and Wyoming, the federal government began to create a recovery plan. 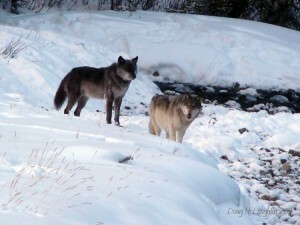 The plan called for wolf reintroduction in Yellowstone National Park and central Idaho. In 1995, the reintroduced wolves hit the ground running. Scientists were on the ground, carefully documenting the ecological effects wolves sent rippling throughout the region as they restored this ecosystem from top to bottom. The subsequent recovery of willows (Salix spp.) and aspens (Populus tremuloides) that elk (Cervus elaphus) had been eating to death in the absence of wolves provides a powerful ecological lesson. The wolf reintroduction was an unprecedented success. By 2002 wolves had met recovery goals of at least 300 individuals and 30 breeding pairs in the three NRM states for at least three consecutive years. Since 2011, wolves have been delisted and hunted annually in the NRM. Because Yellowstone wolves sometimes wander outside the park, the 2012/2013 wolf hunt, combined with other causes of mortality, caused a 12 percent drop in their population. Ecologists agree that this level of mortality is biologically sustainable in a species as resilient as the wolf. However, the impacts of the wolf hunt go far beyond numbers. Before the hunt, Yellowstone’s wolves were one of the few unexploited North American wolf populations. They essentially lived in wolf paradise, with abundant food and little conflict with humans. The wolf hunt changed everything. Because hunting these wolves outside the park affects their behavior inside the park, the hunt ended the invaluable opportunity to study an unexploited wolf population as a scientific control against which exploited populations could be compared. By hunting wolves we disrupt their society and destabilize their packs. Packs may split into smaller packs made up of younger animals, with a greater influx of unrelated individuals. And younger, less-complex packs may kill cattle or approach humans for food. The Lamar Canyon pack, formerly one of the most stable and viewable park packs, provides a case in point. When the gun smoke cleared from the 2012/13 wolf hunt, this pack’s story provides a cautionary tale about the unintended consequences of hunting wolves immediately outside national parks. The '06 female and her mate, 755M. Photo by Doug McLaughlin, used with permission. Before the 2012/13 hunt, an illustrious pair led the Lamar Canyon pack: wolf 832, called the “’06 female” (for her birth year) and wolf 755M. Pack leadership also included wolf 754M, the beta male (755M’s brother), who’d vied for 832F’s admiration and then helped the alpha pair care for their pups. This trio engendered tremendous public affection. Capable of taking down an elk by herself, ’06 quickly became a legend. She ranged widely through the Lamar Valley, yet she seldom left the park. Wolf 754M. Photo by Doug McLaughlin, used with permission. Tragedy struck in November 2012, when 754M met a hunter’s bullet in Wyoming, outside the park. The next month, the ’06 female also went down in the wolf hunt. Their entirely legal deaths played out publicly and created public outrage. But that was only the beginning of the trouble. When breeding season began in late December, one of ’06’s daughters became the new alpha. However, because she was the alpha male’s daughter, she wouldn’t breed with him. And so now 755M, the alpha male, a great hunter with the most social experience, went looking for a mate. This left the Lamar Canyon pack unstable and leaderless. By late January, the Lamar Canyon pack was going through major changes. Two of 755M’s daughters had attracted mates from other packs. Meanwhile, 755M, who’d been wandering, had found a mate, 759F from Mollie’s pack, and returned to his pack with her. But pack dynamics had shifted in his absence, so what he returned to was actually partly his old pack with some new wolves. The new males turned on 759F, killed her, and ran 755M off. By April 2013, 755M’s daughters were both pregnant and preparing for birth, and the pack was spending lots of time outside the park. 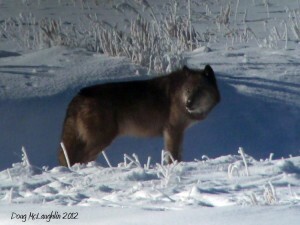 Biologists occasionally observed 755M in Lamar Valley with two other wolves. Eventually ’06’s daughters had their pups. While at first this seemed an example of wolf resilience, further events demonstrate how ’06’s and 754’s deaths disrupted this pack’s social stability. 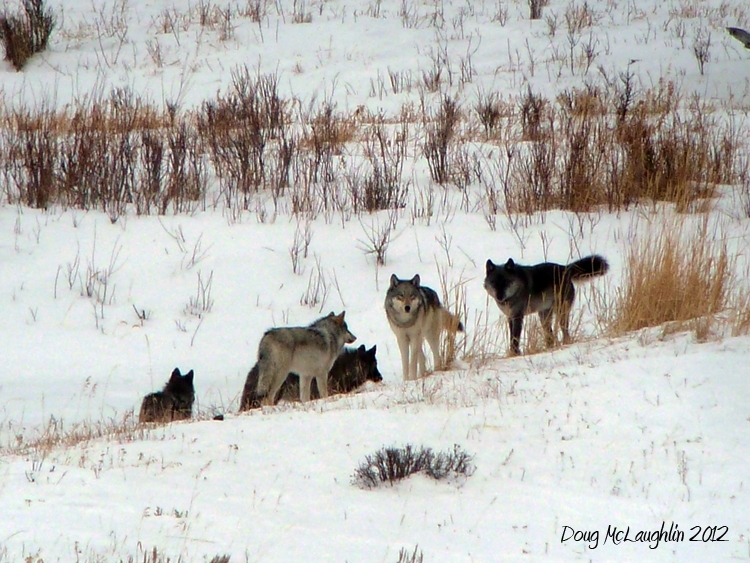 In August 2013, wolf 820F, ’06’s two-year-old daughter, left the pack under hostile pressure from her older sisters. That she’d spent her entire life in the park and was very used to people led her to make a foolish choice. She started hanging out in Jardine, Montana. When she turned to raiding chicken coops for food, Montana Fish, Wildlife, and Parks (FWP) killed her. The above wolf deaths and others occurred because, for the 2012/13 hunting season, FWP removed the partial buffer outside the park where wolves couldn’t be hunted. After the deaths of the ’06 female and 754M in late 2012, the FWP Commission tried to close areas adjacent to the park to hunting and trapping because too many Yellowstone wolves were being killed. When anti-wolf groups sued, FWP removed the buffer. This left park wolves vulnerable in places like Gardiner, Montana, an elk wintering ground immediately outside Yellowstone. This July, Congressman Peter DeFazio requested a wolf buffer zone around Yellowstone. In 2014, the Lamar Canyon pack denned and produced pups. 755M remains a lone wolf. While the Lamar Canyon pack’s ultimate fate remains uncertain, its short-term response to the wolf hunt demonstrates both resilience and great instability in the face of challenges. A reinstated buffer would return these and other Yellowstone wolves to being a protected research population and fully realizing their ecological role.